The St. Louis Disc Dog Club began 17 years ago to create a safe, fun environment for disc-loving canines and their dog-loving owners. Our goal is to teach and promote the sport of disc doggin' in our community and be a resource for dog related news and events throughout the greater St. Louis area. We do this by facilitating training sessions for current and potential new members alike; holding demonstrations, and hosting several discdog competitions throughout the year. 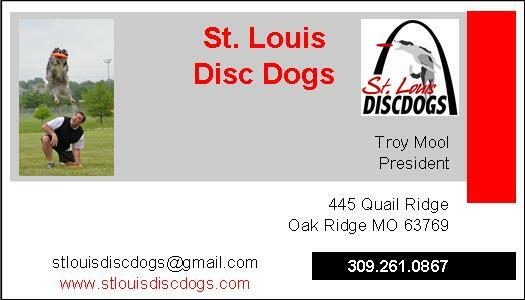 We also aim to be a resource for disc dog-related news and events in the St. Louis area.